"Very professional, punctual and courteous." "I would rate everything - timeliness, communication, quality as all very good with an overall rating of five stars. I would highly recommend Vic to anyone"
"Vic and his team at High Ridge Carpentry and Roofing are professional in every way and a pleasure to deal with. They should be first on everybody&apos;s list to contact for their carpentry and roofing needs. " "Vic is a professional of the highest quality. You can trust him completely. Work was done in a timely and professional way." "They were on time, in budget, clean and thorough "
"I was very happy with High Ridge Carpentry. They responded to my inquiry straight away with a visit and a very reasonable quote. The firm completed the work speedily and to a very high standard. All the staff were very pleasant and a pleasure to have around the house. I would thoroughly recommend High Ridge to anyone." "Victor came out to our home in Purchase to access damage done to our cedar shake roof from a storm in April. He was prompt in coming out and giving my husband and I an estimate to repair damages. He actually came twice to speak to us. His estimate was thorough and very reasonable. He was a pleasure to work with as well as his crew. They were very polite and clean and Victor was on site during the whole job. We are extremely pleased with his work and will definitely hire him again as well as recommending him. He was very easy to communicate with and he executed our job exactly as requested." "Vic, the owner, responded very quickly and was excellent in assessing the damage, providing a reasonable budget and was very prompt in completing the job. We are happy to highly recommend his services to other customers." "High Ridge was the first to contact me and the first to volunteer references. Vic was completely professional and thorough. He explained the service he was going to perform and explained all the steps. I would recommend him totally and will use him in the future." "very professional, did the work on time, and easy to communicate with. whenever I called them and left a message, I always got a respond." "High Ridge Carpentry did the following on my Tudor house: 1) repair slate roof and flat roof, 2) repair and repitch leaders and gutters, 3) power wash, repair, and restucco exterior, 4) put in new construction windows with insulation, 5) repair, replace, and paint exterior wood trim. He also threw in extra services: power wash masonry and patio furniture, rescreen a window, repaint wrought iron railing, remove A.C. units for later installation. Throughout, he was very easy to communicate with. I especially appreciated his artistic eye for detail, his careful listening, and thorough suggestions of available options as he worked to meet my requests. His workers were also pleasant and easy to work with. His cleanup afterwards was thorough; he even offered to get rid of some of the junk in my garage. I recommend him highly." "Highest marks for fantastic service & workmanship! He works with you to achieve the results that you want, instead of what he wants to sell you. He listens to what you&apos;re saying & values your needs and opinions. I wouldn&apos;t hesitate to recommend him to anyone." 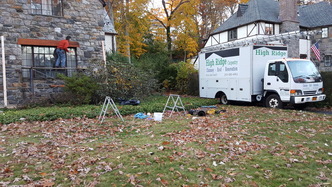 High Ridge Carpentry, does Westchester roof repair, cedar, composite, flat, slate, Spanish and Loduwichi tile. I�m Vic the owner and will be the one to give you the quote and do the work on your roof. Many satisfied customers over 20 years with multiple locations.